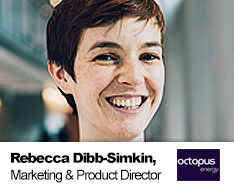 Rebecca is Product and Marketing director at Octopus Energy, a multi-award-winning challenger energy supplier. Octopus is an e-commerce specialist and digital first with product, marketing, and customer service. It’s changing the way people consume and buy energy with ground-breaking product launches like Agile Octopus, the world’s first domestic energy tariff to offer half-hourly prices that reflect actual wholesale costs. From a utilities background, Rebecca was previously a head of product at Centrica-funded Hive, as it transformed from a ‘kickabout’ start-up to the leading smart home provider in the UK.